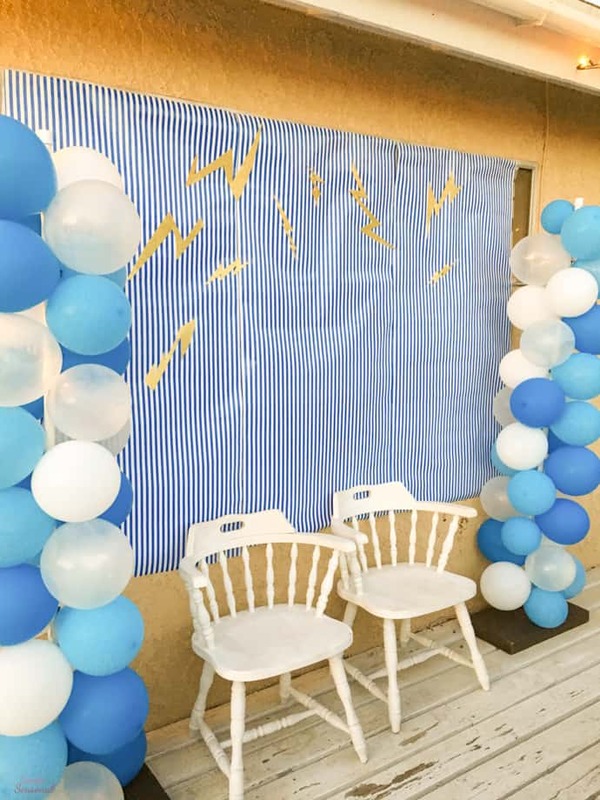 Throw an unforgettable party with these fun Percy Jackson Party Ideas! Find great ideas for what food to serve, themed decorations and silly games and activities that any Rick Riordan fan will love. I love parties. I think it’s so fun to pick a theme and then come up with unique and creative ideas to fit that theme. 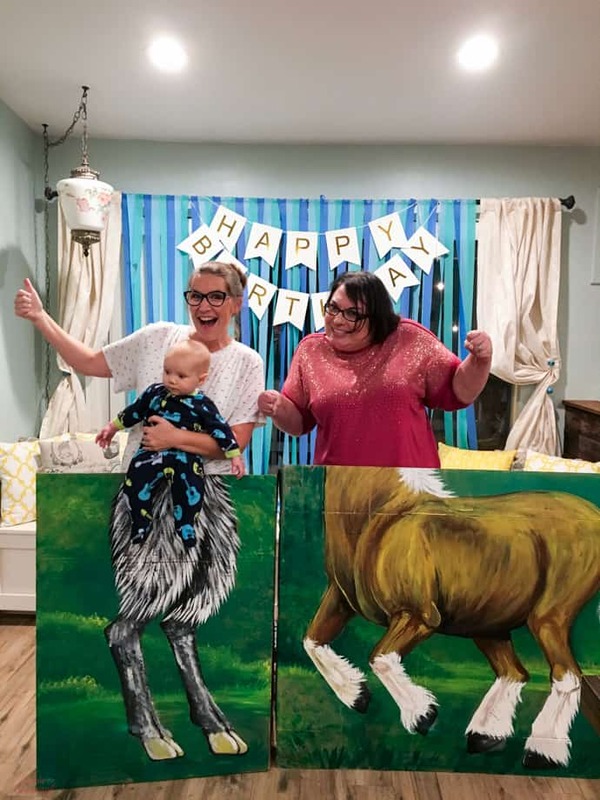 If money were no option, I’d probably be one of those ridiculous people on “Outrageous Kids’ Parties.” However, having a budget means you can get creative, just like my friend did for her daughter’s 13th birthday. 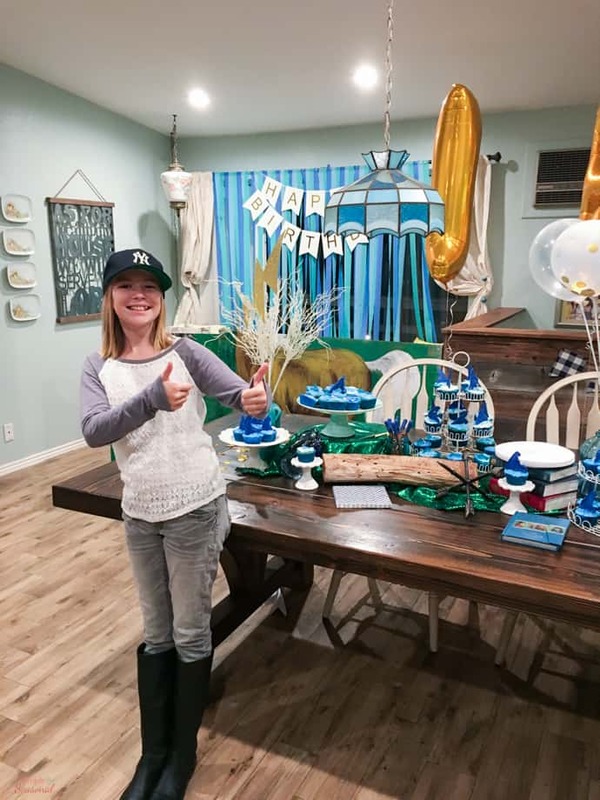 Lily loves the Percy Jackson book series, so her mom threw her an awesome Percy Jackson Party. 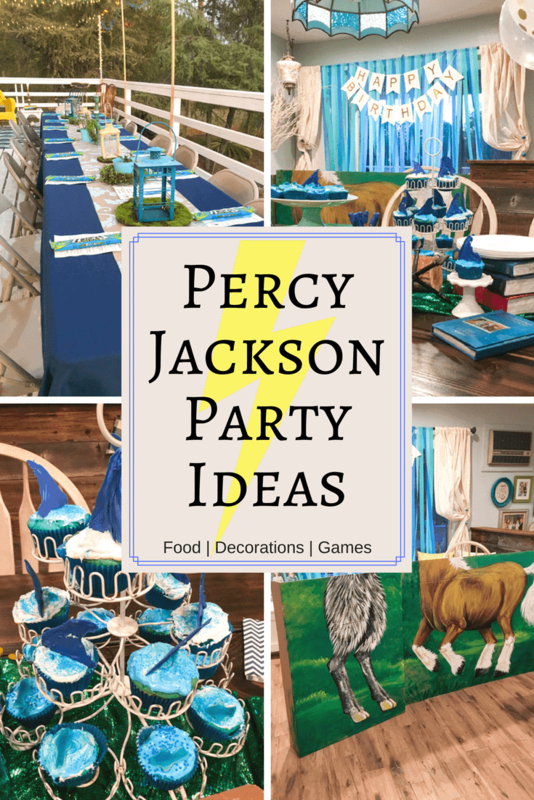 I saw the pictures on Facebook so I asked her if I could share all her Percy Jackson Party Ideas here! After returning home from his boarding school for the summer, Percy and his mother, Sally Jackson, travel to their cabin in Montauk. 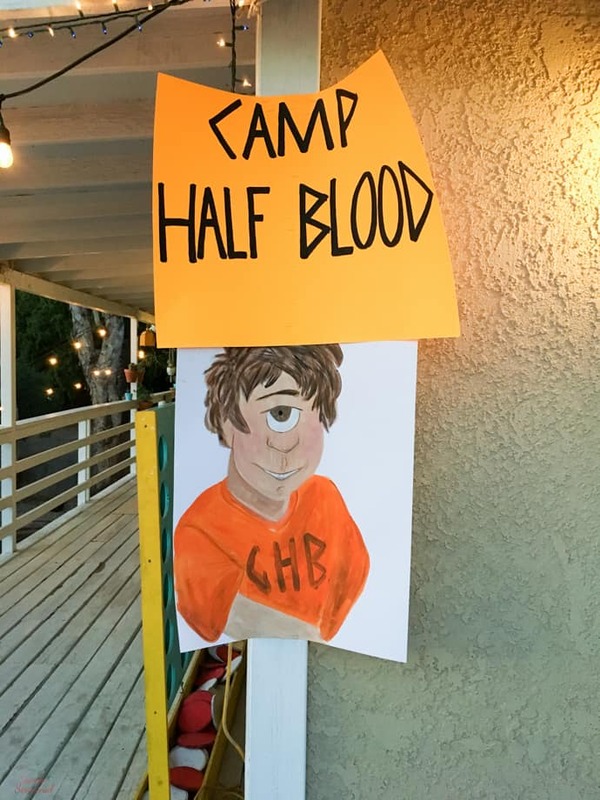 However, the trip is cut short and after a series of harrowing incidents such as being attacked by a minotaur, Percy finds himself at Camp Half-Blood, a training camp for demigods like him. He discovers that he is a demigod son of Poseidon, the Greek god of the sea, earthquakes and father of all horses, that his best friend Grover is actually a satyr and that the Greek gods are accusing him of having stolen Zeus’ master lightning bolt (the most powerful weapon in the world). To clear his name and save the world from another war between the Olympian gods, he sets out to retrieve the lightning bolt from Hades, who they believe is the real thief. 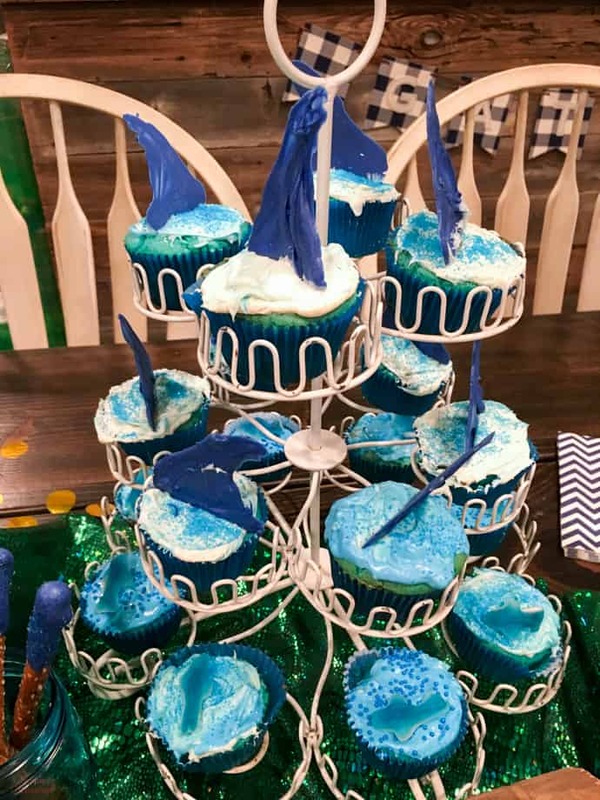 The table here is set with blue velvet cupcakes frosted with two colors and topped with candy waves. The five books in the series are perfect for adding height and texture to the table. There’s also some “driftwood” and other sea elements. The green fabric looks like mermaid scales and is a pretty contrast to all the blue. Add a few lightning bolts and some golden drachmas for a final touch! The obvious choice for color is blue. There’s Percy’s connection to the sea, and also his mother took it upon herself to make or buy blue food any chance she could. This was in response to her new husband (Percy’s step-father) insisting that there’s no such thing as blue food. It became a quiet joke between Percy and his mom. 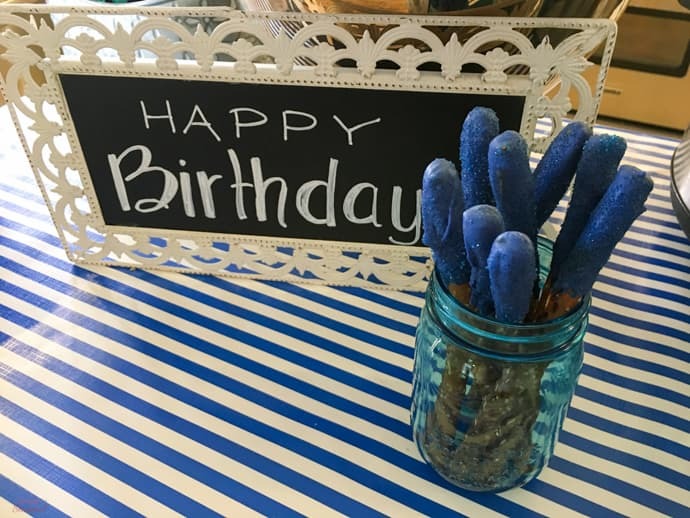 Dipped pretzel rods are a cheap treat and can be made to fit any party color theme! Be sure to pick up some of these handy dipping tubes to make it clean and easy. 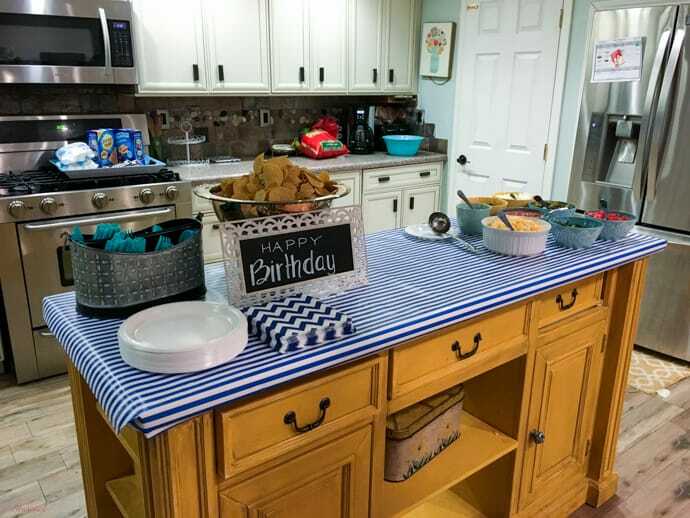 A nacho bar is a great way to serve a crowd while keeping costs down. If you want to continue the “blue” theme, you can buy blue corn tortillas chips! 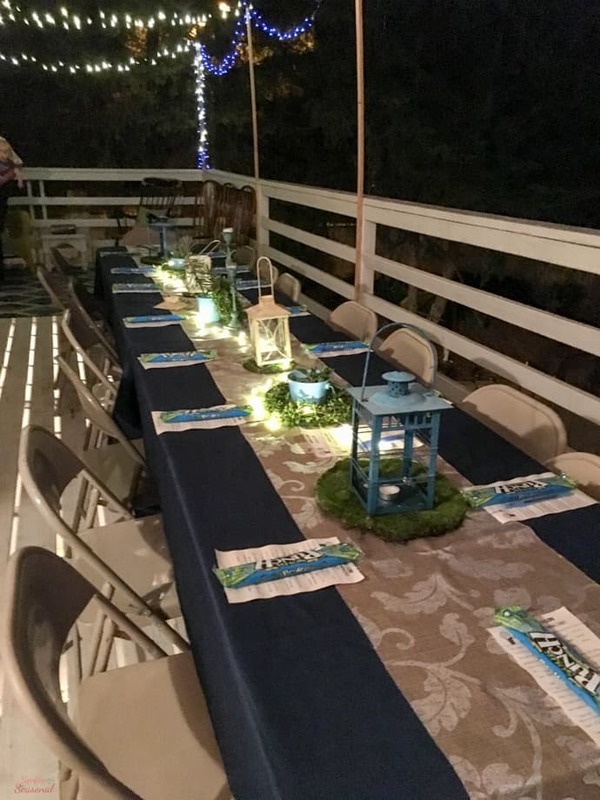 Set a table with drinks and an Ambrosia candy bar. 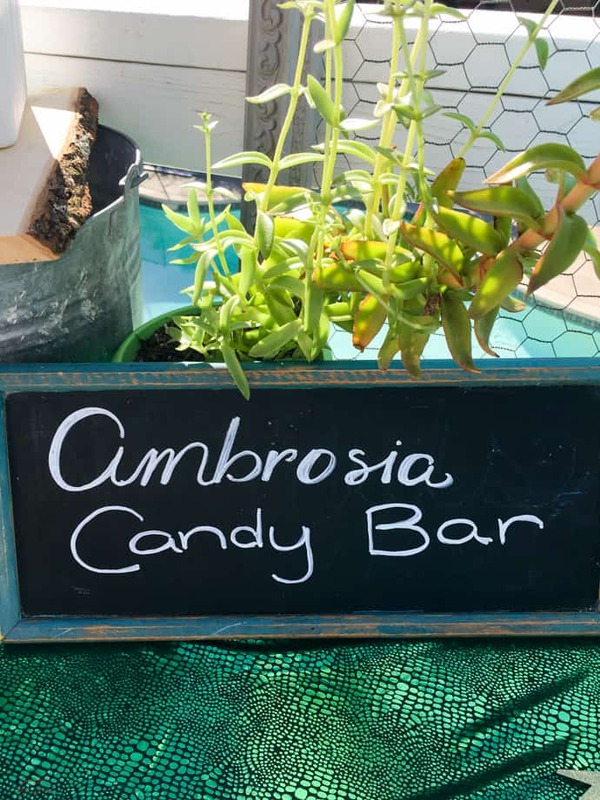 Ambrosia is a candy that’s the food of the gods, and it’s used to help heal the demigods when they are injured. Serve blue gummy sharks, blue salt water taffy, candy covered pretzel rods, and Sixlets. 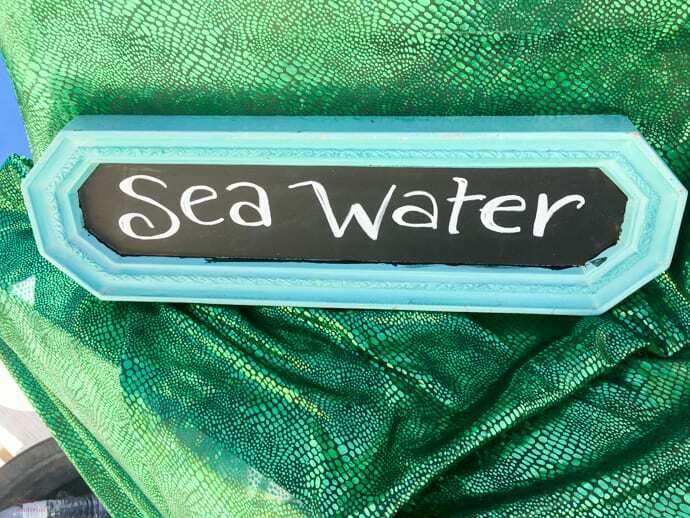 Try this recipe for Blue Punch to use as your Sea Water! It’s simple, delicious, and it only has two ingredients! This “photo booth” is probably my favorite thing of all. If you’re not a talented painter like Donna and her mom, you might be out of luck with this one, but I had to share it. I’m sure you could find a template to project on cardboard and then paint the details. I just can’t guarantee it would be as good as this! Grover the satyr is Percy’s best friend, and Chiron is a wise centaur that helps him on his journeys. 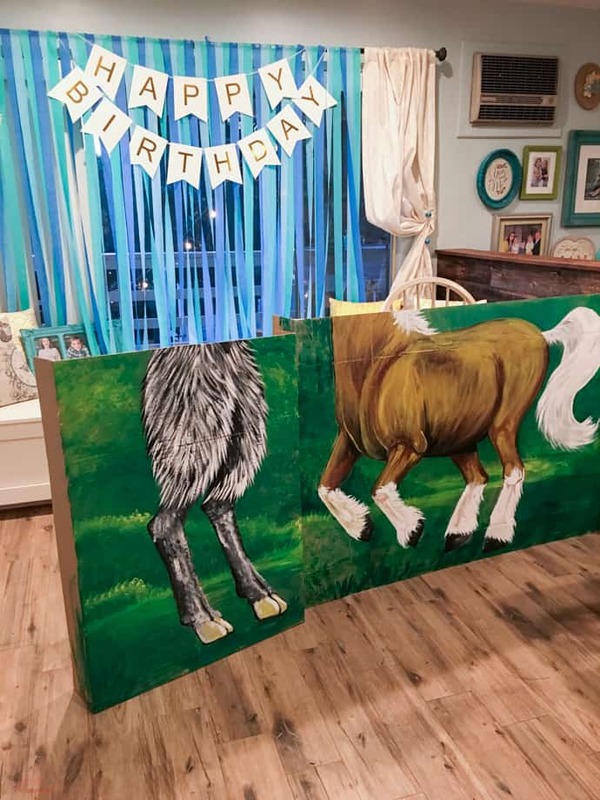 With this fun photo prop, everyone gets to be a satyr or a centaur! Set up an outdoor backdrop for photos. Every teenager loves a good selfie! 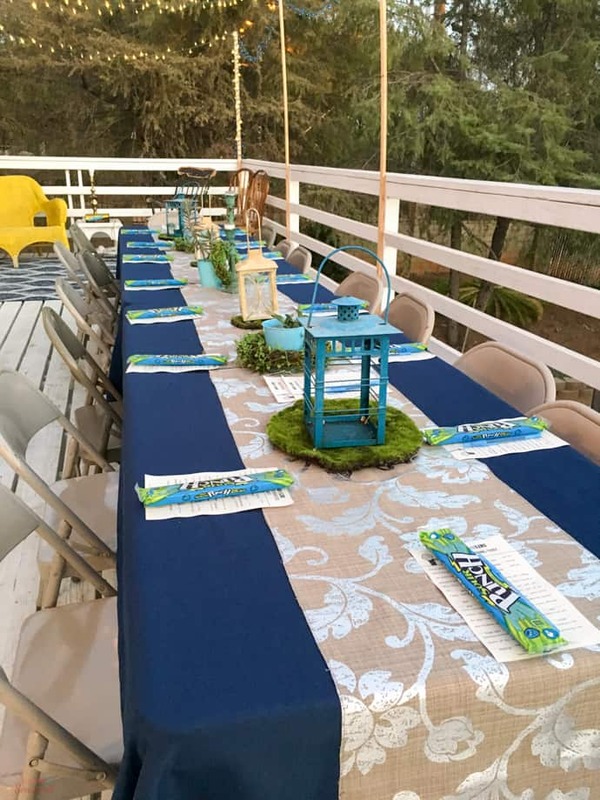 Set a simple table with blue linens, lanterns and moss or other outdoor elements. I imagine Camp Half-Blood as somewhere rustic but still elegant in ways. 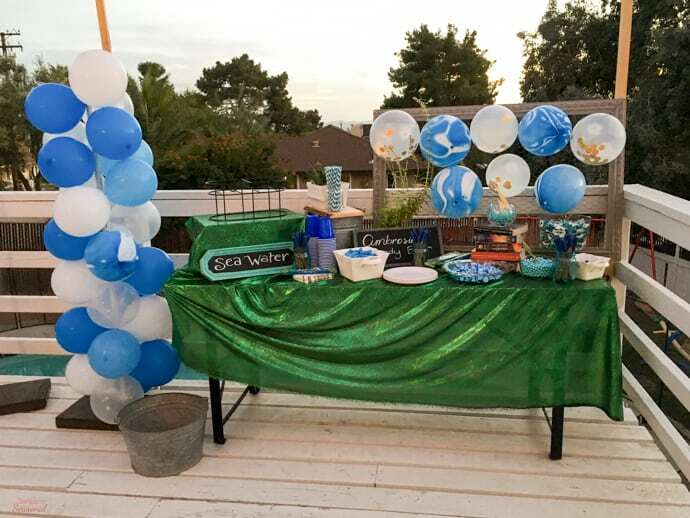 An outdoor setting is perfect for a Percy Jackson Party! 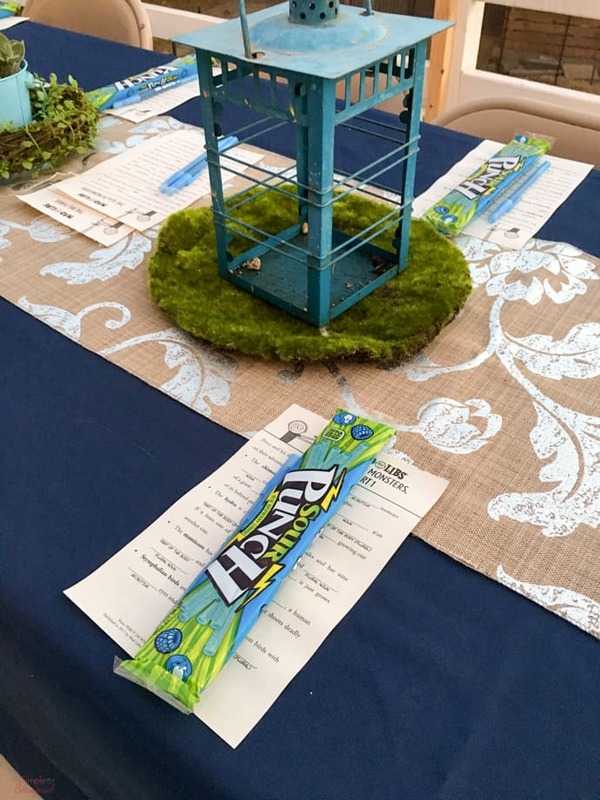 Each table setting is marked with a package of blue (of course) Sour Punch straws and a page from Percy Jackson Mad Libs. They are such a fun ice breaker for large groups! 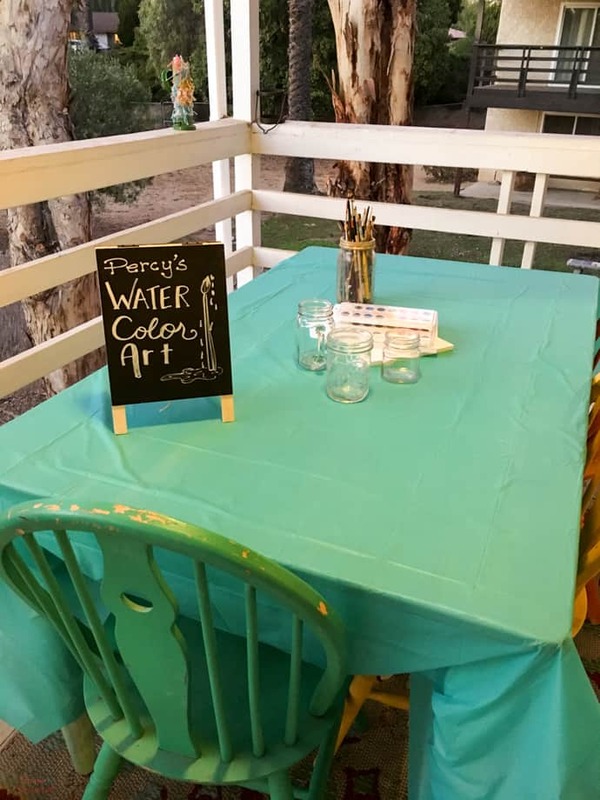 Set a table with water color supplies and let people get creative! 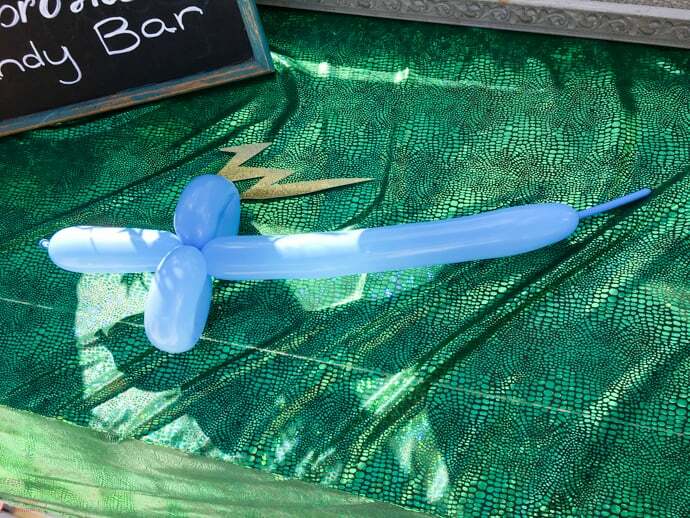 Have an epic sword fight with balloon swords! 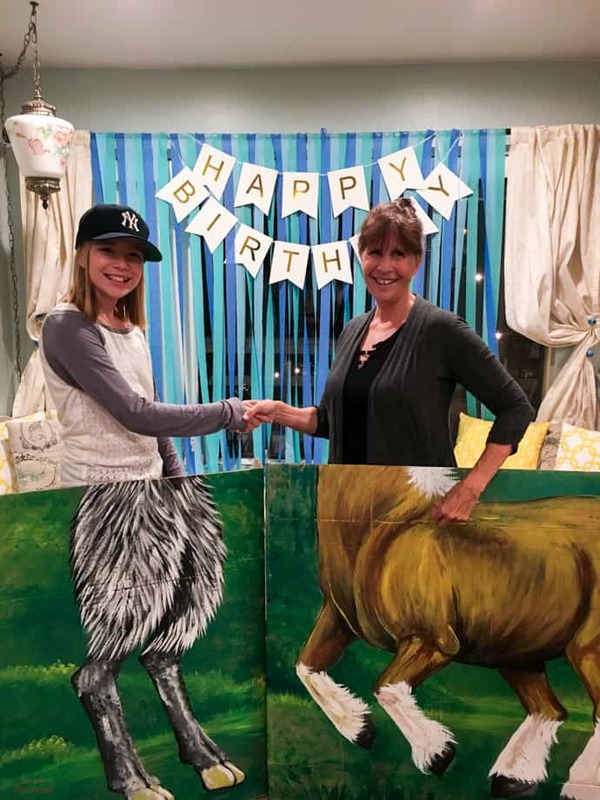 I had to include a picture of the very talented Donna Wilson, creator of this fabulous party. (She’s the satyr on the left.) 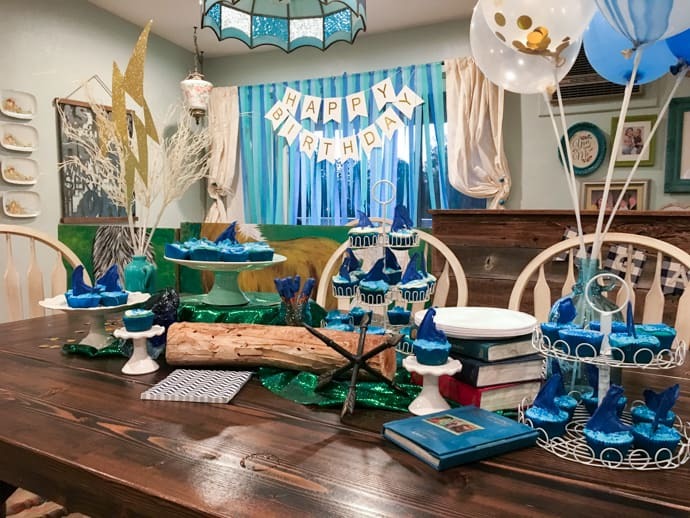 Thanks for letting me share your Percy Jackson Party!